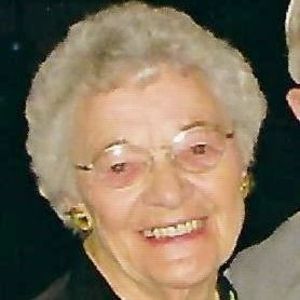 Ethel Rita Rademacher, age 93, passed away on Thursday, July 26, 2018 at Prairie Gardens Assisted Living in Sun Prairie. She was born in Waunakee, April 27, 1925 and was the daughter of Casper and Mary (Acker) Klein. She married Richard J Rademacher on November 15, 1945 at St. John's Catholic Church in Waunakee. Ethel was a farmer's wife. Richard and Ethel started farming in Morrisonville, WI and in 1956 moved to Sun Prairie, WI where they raised their six children and farmed until they retired in 2005 at the age of 80. She loved working the land; watching the crops grow; gardening and canning her fresh vegetables and fruit. She baked many goodies and prepared delicious meals for her family and friends. Ethel was proud of her heritage and enjoyed her family. As a family, Ethel, Richard and their children worked and played hard on the family farm. She also took time to play cards, especially sheepshead; visits to the casino; and traveling. She cheered and watched her children and grandchildren play sports and other special events. She always had her rosary in hand and prayed for her family. Ethel was a member of Sacred Hearts Catholic Church. Ethel is survived by her children, Marilyn (Richard) Schroeder of Rio, Keith (Joan) of Cottage Grove, Jane (John) Leach of Madison, Alan (Fran), Rita (Gary) Buss of Sun Prairie, Kevin (Lori) of Rochester, MN; 17 grandchildren; Kim (Randy) Underdahl, Allan (Kim) Schroeder, Kay (Paul) Yereb, Brian (Nikki) Rademacher, Bruce (Shelly) Rademacher, Staci (Tim) Schmidt, Jacqueline (James) Peters, James (Britt) Leach; Jeff (Jessica) Leach, Wendy (Randy) Clark, Renee (Brian) Schaal, Heidi (Stuart) Meier, Holly (Luke) Hallmark, Michael (Amanda) Buss, Daniel (Jodi) Buss, Tyler and Ryan Rademacher; as well as 35 (plus two unborn) great-grandchildren – Derek (Dayken), Austin, Connor, Brady, Trey, Carlie, Adam, Rachel, Kaitlyn, Hailey, Zoe, Madison, Michael, Morgan, Blake, Julius, Liam, Jasmine, Ava, Ryan, Isaac, Colin, Michael, Ashley, Kellen, Kayla, Elliott, Benjamin, Amelia, Eleanor, Hazel, Piper and Molly; brother, Greg (Irene) Klein and sisters, Elsie Mezera, Betty (John) Fobair , Joan (John) Handel, brother-in-law, Charles Johnson and many nieces and nephews. Ethel was preceded in death by her husband, Richard; great-grandsons: Clayton Underdahl and Joshua Rademacher; her parents; brothers, Claude, Francis and George Klein; sisters, Cecelia Klein, Gertrude Zeier, Mary Ann Dorhorst, Clara Kuntz, Agnes Nilles; brothers-in-law and sisters-in-law. Ethel's family extends their deepest gratitude for the loving care Prairie Gardens' Staff and Agrace Hospice gave our mother. A Mass of Christian Burial will be at 12:30 p.m. on Friday, August 3rd at Sacred Hearts Catholic Church, 227 Columbus St., Sun Prairie, with Monsignor Duane Moellenberndt presiding. Visitation will be from 4 to 8:00 p.m. on Thursday, August 2nd, at the Tuschen-Newcomer Funeral Home, 302 Columbus Street, Sun Prairie and from 11:00 a.m. until the time of Mass at the funeral home on Friday. Following interment at Sun Prairie Memory Gardens, luncheon will be served at the church gathering room. The family suggests in lieu of flowers memorials can be made to Agrace Hospice or Sacred Hearts Building and Grounds. Mom, now you can reunite with dad with open arms. We love you both. You will be missed.